Arthur John Tucker enlisted in the British Army on 18 December 1916 and Served in The Army Service corps (ASC) as a Driver until discharged on 15 Jun 1918. He served in 666 company ASC from 19 December 1916 and 351 Company ASC from 24 Jan 1917. 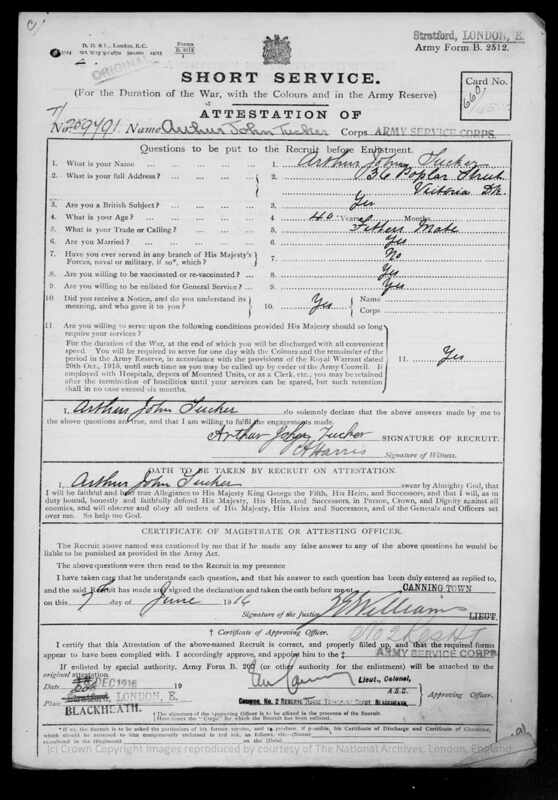 This file contains Arthur John Tucker's, Military Service Record, Discharge papers and Pension documents. Arthur John Tucker was awarded the Silver War Badge No. 523778 for his service during World War 1. An acknowledgement of his service to his country after being discharged medically unfit. Arthur John Tucker is also using the surname of his step father "Ramsey" in some documents. His Birth, Marriage and Military service documents all use "Tucker". The birth of his Children are all recorded under "Tucker", but the 1901 and 1911 Census documents all record his and his family's surname as Ramsey. [S83] Britsh Military Service Records - Army, 1 to 13 (Reliability: 3), 18 Dec 1916.